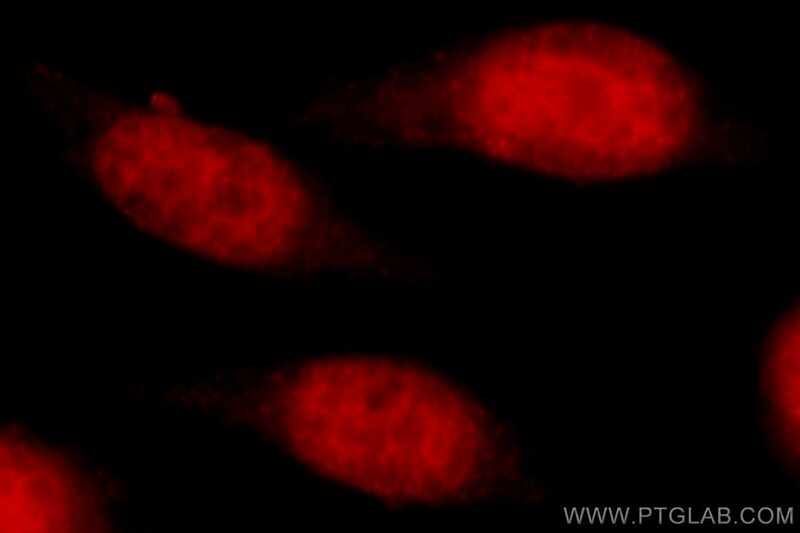 Immunofluorescent analysis of MCF-7 cells, using TBP antibody 22246-1-AP at 1:50 dilution and Rhodamine-labeled goat anti-rabbit IgG (red). TBP, TATA box-binding protein, is a DNA-binding subunit of TFIID, which is a multisubunit complex essential for the expression of most protein-encoding genes. The well-conserved C-terminal domains of 180 aa is both necessary and sufficient for interaction with DNA and for assembly of the basal transcription apparatus.The N terminus of TBP modulates the DNA-binding activity of the C terminus of the protein. Once binds to the TATA box mediated by TBP, TFIID initiate the transcription step of the pre-initiation complex(PIC), playing a role in the activation of eukaryotic genes transcribed by RNA polymerase II. This is a rabbit polyclonal antibody raised against part of N-terminal chain of human TBP, and specially recognize a ~46 kDa band.